Your Vote Counts on November 5! (October 14, 2013) On November 5 and during Early Voting, Charlotte voters will elect a new mayor and city council. Mecklenburg County voters will elect district representatives to the Charlotte-Mecklenburg School Board and vote on two education bond packages. During the last municipal election in 2011, voter turnout in Mecklenburg County was only 16.23%. All Steele Creek precincts except one had a lower turnout than the county average, and the one that exceeded it only exceeded it by .02%. This means that only a small percentage of Charlotte and Mecklenburg voters will decide who will lead the city and the school system over the next few years. YOU CAN MAKE A DIFFERENCE! Be sure to vote on Election Day, November 5, or during Early Voting. Most provisions of North Carolina's new voting law, which requires voters to show an ID and imposes other limitations on voting opportunities, does not take effect until after the 2013 election. 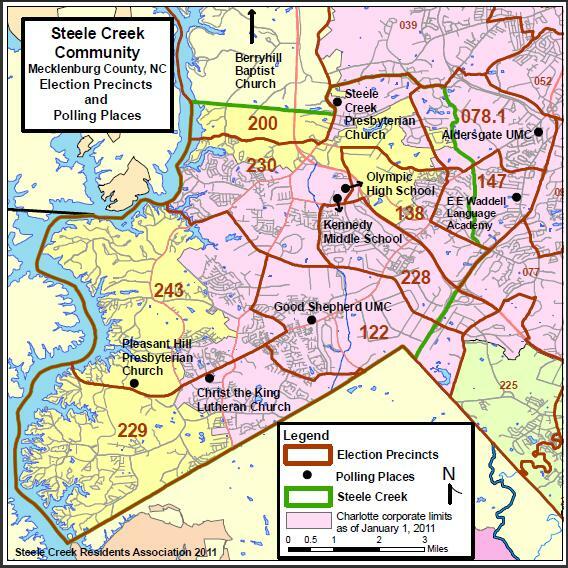 Steele Creek voters who reside within the Charlotte city limits may vote for the Mayor of Charlotte, four At-Large City Council members, and the District 3 City Council representative. All portions of Steele Creek within the Charlotte city limits are in District 3. See Steele Creek Area City Council Districts. All offices have two-year terms. All Steele Creek voters can vote for the District 2 Charlotte-Mecklenburg School Board representative. All School Board members serve four-year terms. District representatives are up for election in 2013. The three at-large members were elected in 2011. See Steele Creek Area School Board Districts. Also on the November ballot are two education bond packages. The $290 million School Bond includes funds to build a 20-classroom addition to Olympic High School and renovate the school's auditorium. See 2013 School Bond Includes $8.9 Million for Olympic Improvements. Any registered voter from Mecklenburg County can vote at any site during Early Voting. Voters must vote at their local precinct if they vote on Election Day, November 5. For more information about the 2013 General Election in Mecklenburg County, see Mecklenburg County Board of Elections.